This smartpen lest you take the notes in analogue form but converts it to digital form for many purpose, a multipurpose pen with plenty of smartness and beauty is here. There are plenty of mobile apps and desktop client available in market that lets you take a better notes on your digital device. But you yourself know, nothing beats the Hand written notes. All the researches have already shown that when you make notes with your pen it retain in mind more than any other method like typing or listening. For the same reason many students and professionals still using classic method for taking the notes on their paper instead of on the digital searchable format. If you are handwrite lover and want to do more than just making notes also don’t want to be away from tech world. This post is especially for you to let you know something new. The fusion is here. Echo Smartpen lets you do all this, how we will discuss in this post. 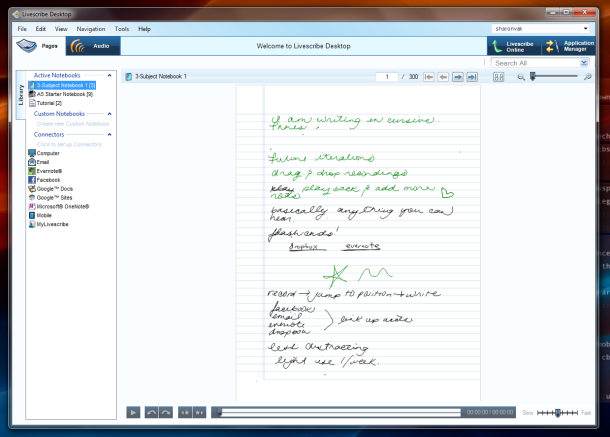 While just like classic ink notes, it automatically digitalise the notes whatever you write on the paper. But magic happens now, this smarpen not only convert the written notes to digital format but also records the sound and play it for you to hear, it even can play the written words for you. 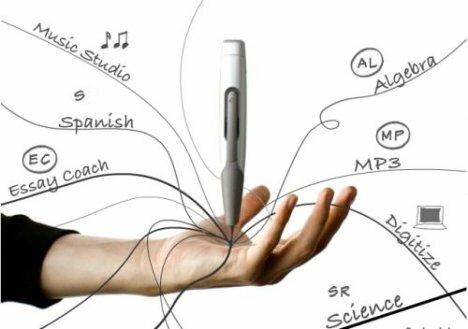 You write the notes in class after hearing the lecture, this Smartpen hears the lecture, lets you take the digital notes in analogue and classic form but it can also record the live lecture that you can listen it anytime. 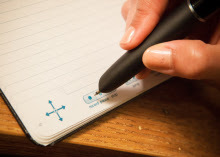 Smartpen is basically works on specialised paper consist of thousands of dots, whatever you write on the paper, these dots will track the word written on them and even will be able to anchor them with audio. For taking the audio notes, simply press “Record” button on the pen and start writing as well as recording, in case you are not able to write anything properly while taking the notes, just tap the word on the paper, your recording at the same time will be played and you will able to correct them what exactly you have written, even make correction and write the missing word at the time. This is the basic use of the Echo smart pen,s the basic use of the Echo smart penissing word at the time. me time will be played and you will able to correct them what exc let’s discuss it ahead. 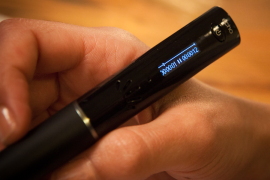 With the desktop application for this pen, its power and beauty goes beyond the paper and recording. The vendor of the Pen also offer the Desktop application [Download it Free]. This application bring the digitalised notes to live. You connect the Echo smart pen to the Computer with provided micro-USB cable with it. 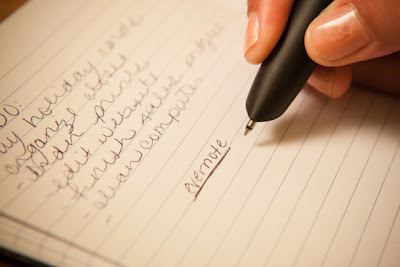 LiveScribe will instantly sync all the written notes with associated audio with it whenever you connect this to PC. You can easily view, playback, organised the notes in file folders easily and even share them easily. Notes that have associated audio, will appear green in colour on the desktop screen, you can even click any of the audio associated words to hear the audio of the time of note making. These are termed as “Pencasts”. You can upload the page as well as audio to the cloud account after saving them to desktop like Dropbox, skydrive etc and share them with people you want. The desktop application lets you export the content to desktop audio or images. To Export the Notes, Ctrl click to select the notes and Right click on the Plane, select “Send X notes to...” and select the destination you want, like evernote, Google Docs, and more, even you can print PDF pencasts in *.M4a Audio or .PNG images. Want to export the audio, just select the Audio tab and follow the same. infringement? My site has a lot of completely unique content I've either written myself or outsourced but it looks like a lot of it is popping it up all over the web without my permission. Do you know any techniques to help protect against content from being stolen? I'd really appreciate it. It's not new thing that your content is being copied, if Google index your page first and their after, feel free that their site will be ranked lower and even won't appear in Google search after some cases. also i would like to suggest you to keep your content fresh and updated and choose unique and professional language completely of your own and different. i'm sure your blog will rank higher and don't care who copies. also you can Google some script which you can add to your site, this will prevent right click and coping your content. and please try to comment as your real ID not Anonymous.